Today is the day to blow the dust off your games and get playing with family and friends. 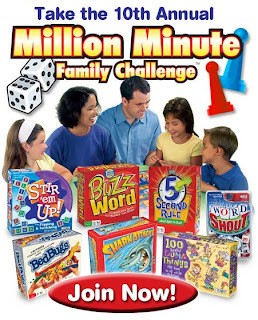 From September 1st-December 31st, you need to keep track of your game minutes to be entered into the Million Minute Family Challenge by Patch Products. This is their 10th year! 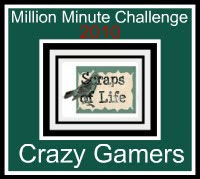 Last year our family and friends joined together and ended up in the top 10 posted minutes and we all reached the goal of one million minutes!!! Our group is called the Crazy Gamers! If you are in our circle of Family and Friends, you can join our group or go make your own! Besides recording minutes they love having each state represented in the challenge! What type of games do you play? I love word games! Who do you play with? Make it a weekly date! Our two main groups play on Tuesday and Saturday. In between those days, we play more one on one. This is great for schools and homeschools! Are you up to it? I'm going to post every Wednesday with our Crazy Gamer minutes. This will also serve as a reminder for you to join in or get your minutes posted! I've been trying to sign up for the gaming site. But when I click on your link, all I get is a * . Sorry you are having problems! I just clicked the links and they are working for me. Maybe their site was down for a bit, I don't know! Here is the link ... try it out. I just went there and all was fine! LMK if you need more helps! This is so neat. I had never heard of the Million Minute Challenge before. I was just thinking about doing a blog post abut my families favorite games, so this is perfect.